The best garage doors are the ones that don't stand out. A well-designed house has architectural features that are in harmony: sizes and shapes are consistent and repeated in windows and doors. When viewing the front exterior, the garage door should blend with the rest of the house; your gaze shouldn't be interrupted by any inconsistent elements on the garage or anywhere else, for that matter. If you live in a sleek, midcentury modern house in which simplicity and clean, horizontal lines are emphasized, don't stick rustic Tuscan-style doors on the garage. Think about it: all of your house can be seen from the street: the landscaping, entry, roof, doors, windows, siding, and other features like porches, railings, and shutters. It also includes the garage and the door on that garage. The space inside a garage that houses and protects your vehicles is called a bay and most contemporary homes have two or three. If your garage door is due for a remodel or upgrade, there are several ways to improve its appearance: replacing the door, painting it, or completely remodeling the garage itself. Pay attention to hardware: Some automatic doors don't have any and opt for a clean, sleek look, while others repeat metals and styles in the hardware used on doors, windows, lighting, and other fixtures. Style: Drive through a neighborhood and notice all the white garage doors with half-circle windows. These seem to be the standard. If this is the best door for your budget, consider painting it the same color as your home's exterior. Or look for alternatives, like wood, corrugated metal, etc. Accessibility: Is it easy to reach the garage from the street, your driveway, your front yard, and your home? Color: Match the color with the exterior of the house for a consistent look. Of course, wood and even some kinds of metals can be painted. There's no rule that you have to leave it white even if it came that way. Research colors that complement one another. Scale: The garage should not overwhelm or upstage the house, either in size or architectural features. As Kate Wagner of McMansion Hell points out, you don't want a garage with a house attached. Materials: A brick house with an all-wood garage painted blue? Think again. Familiarize yourself with your home's architectural style and materials. Or seek advice from a professional. Indecisive? Upload a photo of your home's front exterior to one of many websites that sell garage doors and experiment. If you have absolutely no design sense, ask for assistance from a friend who does. While a well-designed space inside that accommodates vehicles and storage is a goal, how you arrange what's behind those doors is your business. Keep the doors closed and make sure they add curb appeal. Detached: These originated as carriage barns or houses, for horse-drawn carriages in the early 1900s. Carriage houses were separate from the main house because they were usually added on and there was plenty of room on the property to accommodate another structure. Up until the 1950s, most garages were built for one car. By the 1960s, as families grew and women worked and became more independent, the need for larger garages necessitated two- and even three-car garages. Attached: Connected or structurally part of the main house. An attached garage can be accessed via the inside of your house or through the garage doors. Some people--especially those who have homes without basements--don't have room in their garages for cars and use them for storage. During the homebuilding boom In the post-World War II years, garages became more integral in the design of a home and were often designed to be prominent--in view. Consumers were buying new cars and wanted their neighbors to see that Chevrolet or Buick when they pulled in and out of the driveway. And for inspiration, enjoy 19 very different examples of garage doors. We know that historic homes didn't have garages that housed numerous automobiles. But to bring this old home in Massachusetts up to contemporary standards, D. R. M. Design Build added a garage with a roof and doors that echo the home's features. Older homes in designated historic districts or homes that are part of neighborhood or homeowners associations are often restricted from adding multi-car attached garages. Why? If the house is historic or a specific architectural style, like Victorian or Craftsman, a large connected garage will look awkward and may not be allowed or approved because of city, county, state, or federal preservation restrictions. Garage doors are the auto entry to the building - the doors, their architectural frame, and the driveway. This element occupies a major portion of the ground floor of a building on the typical narrow lot and therefore has a major impact on the pedestrian perception of the building. Does the proposed garage door fit in with the rest of the project? Is the scale of the garage door compatible with its adjacent garage doors? Can the visual dominance of the door be reduced? Can its visual appearance be improved? While planning a garage door remodel, think about all of the architectural elements of your house and whether the garage and its door will complement it or compete. Housing a collection of classic cars was a main concern for a client in the Orakei Basin of Auckland, New Zealand. Daniel Marshall Architects' solution was to create an entry courtyard in which the garage doors are flush with and "disappear" into the adjoining cedar exterior. The courtyard was conceived as a three-level atrium, coaxing the homeowners and guests up to the living level, where floor-to-ceiling windows offer spectacular views of the city. A quaint vintage home near Baltimore, Maryland, was redesigned for the new homeowners' lifestyles and needs. Basically, Smithouse Construction renovated the entire house, added a second story, a master suite, built a porch, and constructed a garage to shelter multiple cars. Working with the architectural firm Patrick D. Jaronsinski & Associates, Smithouse installed Cloplay Coachman doors, which perfectly match the house in style and color. Retaining a similar aesthetic but incorporating new materials and a 21st-century update, Moss Yaw Design Studio renovated a midcentury modern home in Laguna Niguel, California, designed by George Bissell in the early 1960s. Among their changes: Concrete, horizontal wood slats, and a modern frosted-glass garage door. Among other structures, Lands End Development of Crosslake, Minnesota, builds attached and detached garages that are ideal companions to their primary houses. The garage doors on this rustic design at Lake O'Brien were custom made and include charming elements like multi-paned windows that follow the arch of the door and a vintage-looking overhead light. The San Francisco bay area city of Berkeley has always stood out for its creativity and personal expression. As the home of the University of California, Berkeley, residents are diverse and active in local issues. Homes include everything from modest cottages to Victorians built in the 1880s to residences designed by renowned architects Frank Lloyd Wright, Julia Morgan, and Bernard Maybeck. Since 2016, Berkeley native and resident Ian Wood has been documenting the varied and often colorful garage doors of his hometown, which he shares on his website, Berkeley Garages, and Instagram account. This Vine Street garage shows how plants--colorful bougainvillea--soften the look of a home and garage and evoke the essence of older, Spanish-style California design. And why it will never go out of style. Other cities have quirky and creative residents and garage doors, including San Francisco (it's California, after all), and older cities in the Eastern United States with less-strict codes. While still visible from the front, the garage of this modern San Francisco area home is angled away from the front door and accessed via a driveway made of concrete slabs. Designed by Treeium, a remodeling company based in Southern California, this type of garage door is a popular style for contemporary homes. Frames are clear to black aluminum and panels can be solid wood; anodized aluminum; clear, mirrored, frosted, obscure, or bronze glass, among others. A 1950s-built midcentury modern tract home in Anaheim, California, displays many of its original features. Among them: the garage door. Instead of replacing it with a white door from a local hardware or building supply store, the homeowners painted the garage door to match the house and placed wood strips on it to repeat the home's architectural details. It's a much smarter choice than a white carriage house-style door. The challenge: St. Louis, Missouri, midcentury modern house with a one-car detached garage that was in need of repair. Working with the 1950s-era architect's original drawings, Mosby Building Arts created a new garage that repeated the style of the home, from roof slope to brick color. The custom overhead door is based on a Frank Lloyd Wright design. The project also includes new landscaping that incorporates salvaged pieces from the original garage and pathway, along with a new concrete driveway with curbs to aid in water drainage. A warm, rich Colorbond Timbagrain classic cedar garage door, part of the B&D Panelift Madrid line, is featured on the exterior of this home in Perth, Australia. 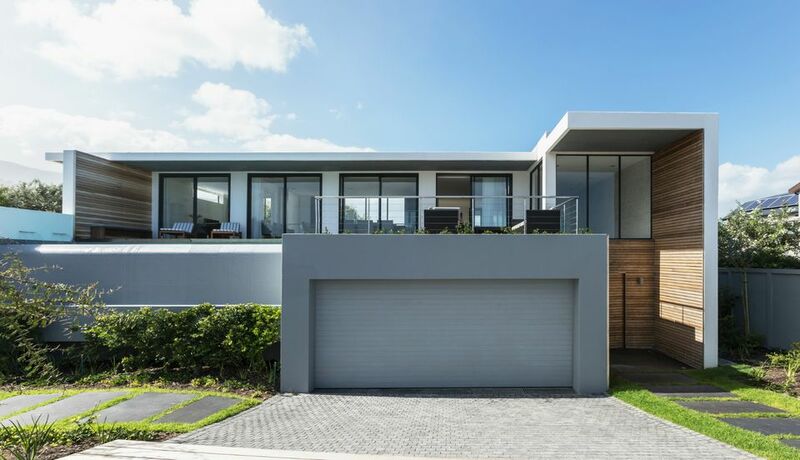 Spearheaded by Moda Interiors, the modern house's horizontal lines are repeated in the placement of the boards and direction of the woodgrain on the garage and front doors, along with the second-story shutters. Charlie & Co. Design designed a modern shingle style home in Minneapolis to incorporate garage doors that resemble the elegant wood designs of traditional carriage house doors. The garage slopes in one direction off to the side and rainwater is shed away from the house via a scupper. Garage doors mirror details of this Daniel Island house, down to the paned windows and hardware. Located in Charleston, South Carolina, the project was a team effort by Barrow Building Group and Kenneth Miller Architecture. A large, contemporary home in Orange County, California was designed by Teale Architecture and Interior Design and features Sonoma White stone on the exterior that surrounds the garage. The wood doors of the three-car garage are stained in Duckback's Superdeck PurpleHeart. Located in Gatineau Hills, Minnesota, a contemporary house and attached garage present a seamless exterior with a reclaimed-wood facade. Created by Christopher Simmonds, the custom-designed and built shingle-style house features cement-fiber panels below the wood. The cement panels are weather and insect-resistant. A home in the Hollywood Hills was renovated by Tim Barber Ltd Architecture into a Colonial Revival design that features Cloplay Coachman garage doors that fit perfectly with the rest of the home's details. Everything is linked by keeping surfaces white with a dark green-painted door, shutters, and trim. A midcentury modern home in Minneapolis, Minnesota, was renovated by Christian Dean Architecture using composite cement board siding, cypress wood siding, new railings, and soffits. Designed in the early 1970s, this home relies on complementary materials, textures, and colors to convey its modern Spanish style. While the garage door was updated, it matches the front door in color and texture. Flat-panel steel doors with a smooth finish were painted a brownish-black to continue the modern look and lines of this house in Edmonton, Canada. Designed by Habitat Studio, the area above the garage doors is vertical metal siding in a champagne color. Sloping, or pitched, roofs are a popular choice in shed design--they are more intriguing to look at than flat-roofed styles and water is able to drain quicker and more efficiently. This simple design, by Lawrence Architecture of Seattle, combines wood with a textured gray surface for a contemporary appeal.